"If the object of the United States is to annex these islands, why not recognize the government established in them, in order in that manner to join with it the same as by annexation? "Why do not the American generals operate in conjunction with the Filipino generals and, uniting their forces, render the end more decisive?" Shown below is Aguinaldo's letter. This is part of the US Senate Document 208, Page 15. "I have done what they [the Filipinos] desire, establishing a government in order that nothing important may be done without consulting fully their sovereign will, not only because it was my duty, but also because acting in any other manner they would fail to recognize me as the interpreter of their aspirations and would punish me as a traitor, replacing me by another more careful of his honor and his dignity. "I have said always, and I now repeat, that we recognize the right of the North Americans to our gratitude, for we do not forget for a moment the favors we have received and are now receiving; but however great those favors may be, it is not possible for me to remove the distrust of my compatriots. "These say that if the object of the United States is to annex these islands, why not recognize the government established in them, in order in that manner to join with it the same as by annexation? "Why do not the American generals operate in conjunction with the Filipino generals and, uniting their forces, render the end more decisive? "Is it intended, indeed, to carry out annexation against the wish of these people, distorting the legal sense of that word? If the revolutionary government is the genuine representative by right and deed of the Filipino people, as we have proved when necessary, why is it wished to oppress instead of gaining their confidence and friendship? "It is useless for me to present to my compatriots the favors received through Admiral Dewey, for they assert that up to the present, the American forces have shown not an active, only a passive co-operation, from which they suppose that the intentions of these forces are not for the best. They assert, besides, that it is possible to suppose that I was brought from Hongkong to assure these forces by my presence that the Filipinos would not make common cause with the Spaniards, and that they have delivered to the Filipinos the arms, abandoned by the former in the Cavite Arsenal, in order to save themselves much labor, fatigue, blood, and treasure that a war with Spain would cost. "But I do not believe these unworthy suspicions. I have full confidence in the generosity and philanthropy which shine in characters of gold in the history of the privileged people of the United States, and for that reason, invoking the friendship which you profess for me and the love which you have for my people, I pray you earnestly, as also the distinguished generals who represent your country in these islands, that you entreat the Government at Washington to recognize the revolutionary government of the Filipinos, and I, for my part, will labor with all my power with my people that the United States shall not repent their sentiments of humanity in coming to the aid of an oppressed people." 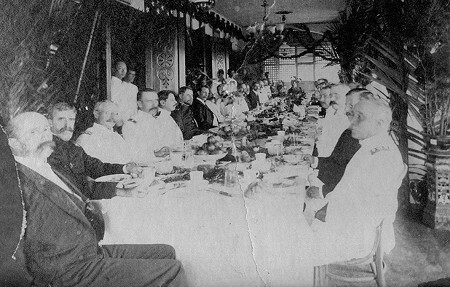 On August 4, 1898, at the U. S. S. Baltimore in Manila Bay, Consul Williams wrote US Secratary of State William R. Day. SIR, It has been my study to keep on pleasant terms with General Aguinaldo for ultimate objects. By so doing I have avoided certain troubles and aided our forces. Admiral Dewey says I have planted the seeds of cordial co-operation. "My argument with General Aguinaldo has been that the conditions of government by U. S. A. in the Philippine Islands would be vastly better for him and his people in honor, advancement, and profits than could exist under any plan fixed by himself and Filipinos. I have traversed the whole ground of government with him in council,,and he has called his officials from fifteen provinces to meet me for their discussion, all stated as friendly but unofficial on my part. Our relations are cordial, while certain antagonisms have arisen between the General and certain other Americans. "I hope to bring about harmony and co-operation for mutual good. "I have the honor to be, sir, your most obedient servant."